The intermittent rains experienced in many parts of the country right now has increased the threat of a dengue outbreak, while the number of dengue cases reported in the first five weeks of 2018 stood at 6,203 by today, with five deaths. The Government Epidemiology Unit (GEU) announced today that during the last 12 months of the year 2017, 184,442 suspected dengue cases have been reported to the Epidemiology Unit throughout the island. Approximately 41.53% of dengue cases were reported from the Western province. The GEU said this situation warrants regular removal of possible mosquito breeding sites from the environment and it is important to seek medical attention in the event of fever by day three of the illness. Meanwhile, Health and Indigenous Medicine Minister Dr. Rajitha Senaratne said the Health Ministry would do its utmost to prevent a dengue outbreak, though the year 2018 has been identified as a dengue epidemic year, and added that it was common that a dengue epidemic has been experienced once in every two years in the last couple of decades. “We have used so many chemical, biological and traditional methods to control dengue with limited success. For instance the use of BTI (Bacillus Thuringiensis Israelensis), vaccine and fumigation did not bring desired results. We have now decided to introduce a natural bacteria species Wolbachia that would control transmitting dengue virus by mosquitoes to humans with foreign assistance, Minister Senaratne said. He said the Ministry of Health will enter into a ‘Collaboration Agreement’ with the University of Monash, Australia under the World Mosquito Programme, on the implementation of the proposed Wolbachia Project in selected areas of the Colombo District endemic for dengue, at a cost of A$ 1 million (Rs. 120 million). ‘Aedes aegypti’ is the main vector for dengue in Sri Lanka. 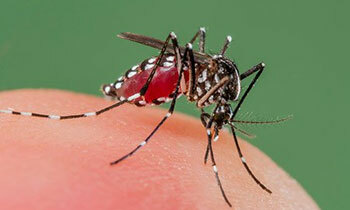 Vector control is the main strategy to control the spread of the disease. However, traditional vector control strategies have so far failed to curb the increasing incidence and therefore the disease has now become a key threat. Our politicians specially this government is busy fighting with each other while real issues like this is lurking around. We need a completely new political culture. WE ALWAYS WORRY ABOUT FEMALE MOSQUITOES AND FIND WHERE THEY LAY EGGS, CAN'T WE DESTROY THE MALE ONES FIRST ? MS is responsible for the death and destruction caused by dengue over several years firstly as the Minister of health and now as the president. He was happily relying on penalising the citizens while what actually happened was corruption in the name of prevention. We were provided with wild statistics rather analytical ones. The real cause is infected mosquitoes bread from containers. The dengue could be eliminated by targeting infection sans penalties. Natural environment is the best way to eliminates diseases as most plants have medicinal properties. Doctor Soon will address on this Issue Soon..